This chapter discusses the main factors which have contributed to traffic safety in the past, and might contribute in the future. One goal of such discussion is to help identify and clarify approaches worthy of most attention in the future. I believe that the problem is far too multidimensional and complex to be susceptible to any tidy analytical solution using such techniques as multivariate analyses, especially as such methods are inadequate to address even much simpler and narrower problems (Chapter 4). As progress using the reductionist scientific method seems unlikely, we instead compare and combine judgmentally various of the factors discussed in the earlier chapters, and seek analogies with other fields. The approach adopted is somewhat similar in spirit to that used in historical and social analysis. An appropriate starting point for an attempt to estimate which factors are likely to contribute to future increases in traffic safety is to examine broad historical trend in traffic safety in different countries. and indicate fatality rate declines ranging from between 4% per year to 10% per year (Table 13-1). Because national distance of travel is estimated only after motorization becomes fairly established, comparable rates are unavailable for less economically developed countries, but are expected to be much higher in view of the pattern in Table 1-1. The association between larger annual declines in rates (Table 13-1) and higher rates (Fig. 13-1) might suggest that, as rates decline, further declines become less likely. The examination below of the trend over a much longer period suggests that this may not be so, thereby adding plausibility to an alternative explanation that countries with higher rates are learning from countries with lower rates. fit). The data for the last couple of decades (Fig. 13-1), rather than indicating saturation, in fact show a larger, 4.0%, decline. For UK data from 1949 to 1985, Broughton  obtains r2 = 0.993 and a decline rate of 4.8% per year, with little indication that the rate of decline in the most recent data is less than the historical trend. The lower curve in Fig. 13-2 shows fatalities per registered vehicle from 1900 through 1988; this rate, although a less satisfactory traffic safety measure than fatalities per unit distance of travel, is available for more years and more countries (Table 1-1). The log-linear fit to the 89 years' data (r2 = 0.949) gives an annual rate of decline of 3.1%, essentially the same as the 3.2% decline for fatalities per unit distance of travel. For UK fatalities per vehicle from 1930 to 1985, Broughton  obtains r2 = 0.984 and an average decline of 4.7% per year. Currently, most less economically developed countries have rates per vehicle corresponding to those at some earlier period in the US, while some have rates many times higher than ever recorded in the US (Table 1-1). Fig. 13-3 shows the annual change in fatalities per unit distance of travel (that is, the percent difference between the 67 pairs of consecutive points plotted in Fig. 13-2). For 16 of these the rate increased, compared to 51 decreases. The largest increase, 8.4%, occurred from 1942 to 1943. Decreases exceeding 10% have occurred on seven occasions, including two affected by energy supply problems (1973 to 1984, and 1981 to 1982). The percent declines per year show no discernible trend away from the long term average of 3.5%. The two most recent values are a declines of 3.85% from 1986 to 1987, followed by a decline of 3.75% from 1987 to 1988. Another way of looking at the declines in fatality rates is the time it takes for the rate to halve, as shown in Table 13-1. All the halving times in Table 13-1 are in the range 6.8 to 17.5 years, with a mean of 11.1 years and a standard deviation of 3.8 years. The halving time over the longer period covered in Fig. 13-2 is 21.4 years (22.5 years for the fatalities per vehicle rate). Improvements in medicine and emergency medical services have undoubtedly contributed to declines in traffic fatality rates, although no quantitative estimates are available. The ability of medical advances to reduce traffic fatalities is limited by the substantial fraction who die during or immediately after the crash; recent FARS data indicate almost 50% of fatalities are dead at the scene. as societies mature. Second, in the past it was more likely that patients had to pay medical costs directly out of their own pockets, leading to many injuries being self-treated or ignored which today are counted in official records. As discussed in Chapter 1, fatality is the level of injury least susceptible to problems of definition and reporting bias. Some generalizations appear to apply to the evolution of motorization in all countries. In the early stages, fatality rates (per vehicle or per unit distance of travel) are high, with pedestrians comprising a large fraction of victims. Although fatality rates decline during the period of rapid motorization, the number of fatalities increases, with particularly steep increases in vehicle occupant fatalities. When the (proportionate) rate of growth of motorization slows, ongoing declines in fatality rates lead to a reduction in the total number of fatalities. The number of traffic fatalities per unit distance of travel shows a remarkably consistent and stable time trend in country after country, and in decade after decade, as shown in Figs 13-1 to 13-3 (and the UK experience). Given this prior experience, it is difficult to understand why Trinca et al. and Mackay  are so inclined to discount the likelihood of continuing declines, or why predictions of future fatalities have been made assuming a constant rate [Sivak 1987, discusses an earlier prediction which, as one would expect, turned out to be grossly high]. The total number of fatalities is the product of distance of travel and fatality rate (fatalities per unit distance of travel). If distance of travel increases proportionately faster than the fatality rate declines, the number of fatalities will increase, and vice versa. In the US, traffic fatalities peaked in the mid 1960's (Fig. 3-12). Various attempts have been made to model the increase, and later decline, in fatalities that seems a characteristic of the evolution of fatalities [Oppe 1989; Koornstra 1988]. There was a particularly large decline of 45% in Japan, from 22 059 in 1970 to 12 186 in 1985. The variation in halving times, from 6.8 years to 21.4 years, with the standard deviation about a third of the value, probably reflects real variability from country to country [Jacobs 1982]. Similar variability occurs around relationships between fatalities per vehicle and vehicles per capita [Smeed 1949; 1968]. While such relationships offer insights into underlying processes, they have too much uncertainty to be useful for specific comparisons between countries or periods. The finding that fatality rates tend to halve every 7 to 21 years should not be misinterpreted to indicate that the process is in any sense spontaneous or natural. To so interpret it would be just as incorrect as to interpret Smeed's relationship between fatalities per vehicle and vehicles per capita as reflecting that interventions are largely irrelevant, as has been suggested [Adams 1985]. Such relationships reflect not spontaneous effects, but rather the collective influence of all the processes, including interventions to increase safety, that tend to accompany evolving motorization. It is the main purpose of this chapter to discuss what these main processes might be. and morbidity. One of the simplest measures of overall public health is longevity. This has been increasing in nearly all industrialized countries, in many cases more than doubling in 75 years [Sagan and Afifi 1978]. Longevity increases have been related to some single variables, such as energy consumption per capita [Sagan and Afifi 1978] or wealth per capita [Chapter 3 of Wildavsky 1988, "Richer is sicker versus richer is safer"]. Zeckhauser and Viscusi  write that sustained economic development seems to be the principal factor in explaining mortality gains in the US. Explanations involving wealth also help explain longevity declines in the Soviet Union [Holding 1981] and similarly structured countries. Explaining longevity in terms of such broad measures as energy consumption or economic development is similar to explaining reductions in fatality rates in terms of increases in motorization, in that specific mechanisms are not identified. It seems universally accepted that many factors have made major contributions to increasing longevity. Many are technological in nature -- surgery, antibiotics, vaccines, organ transplants and the like. Many involve improved physical and institutional infrastructure -- better housing, sewage, ambulance service, refrigeration. Many are legislative -- food inspection, hygienic requirements for commercial food preparation. Many come from changes in collective human behavior regarding hygiene, diet, exercise, alcohol and tobacco use. Traffic fatality rate declines reflect contributions from these same four broad inputs -- technology, infrastructure, legislation and behavior change. In the public health arena I have never heard it alleged that that any of these are unimportant; a less balanced tradition has arisen in traffic safety in which from time to time claims have been made alleging that some of these factors have never made, nor can ever make, any contribution. The ideal way to determine if one factor influences traffic safety would be to vary that factor while all others remained constant, the method used in the physical sciences. Because many factors vary concurrently in traffic, it is rarely possible to attribute a change in casualties unambiguously to just one. Fatality rates on US Interstate freeways provide one example which approaches an ideal natural experiment. Fig. 13-4 shows the fatality rate for the US rural Interstate system from the first year for which such data were available, 1966, through 1988. From 1966 to 1986 the rate declined by 66% (but has been increasing lately -- see Chapter 6). Although safety improvements (better guard rails, break-away sign supports, etc), are being incorporated continuously into existing roads, and designs for new roadways are subject to additional refinements, the broad characteristics of the rural Interstate system are relatively similar over its entire length, and have not changed all that much in time. Thus the 66% decline in fatalities per unit distance of travel occurred on roadways with essentially similar characteristics, and cannot therefore be attributed to improved roads. had little effect on aggregate rates. Similarly, overall national medical procedures cannot change much in one year. The reduced travel which occurred in this same period should, nominally, have no effect on fatalities per unit distance of travel because this rate is already normalized for distance of travel. The decline therefore results clearly from changes in collective driver behavior induced, in part at least, by the introduction of the nationwide 55 mph speed limit. Koornstra  interprets the drop in 1974 in Fig. 13-4 as a temporary perturbation in an otherwise log-linear decline, suggesting that even without the perturbation the present rate would be pretty much where it is now. The data are certainly compatible with such an interpretation. Even if this were so, there still remains the basic question of why the log-linear decline should persist for this essentially unchanged roadway environment, a question central to the present discussion. Fig. 13-5 shows factors ordered judgmentally in an hierarchical structure suggested by the discussion in the previous section, and by additional discussion in Evans . Of the two broad categories, human infrastructure (or human factors) is considered to have a larger influence than engineering infrastructure. Under each of the two major headings, a number of more detailed factors is listed in what I consider to be their order of importance. There are many factors not shown which influence traffic safety; the goal is to concentrate only on those with the largest influence. While medical advances are important, they are best considered separate from the more specifically traffic-related factors, and fall outside the scope of this book. Let us stress something of the utmost importance that applies in all that follows. All the factors interact, in some cases very strongly. In the interests of simplicity, we shall neither dwell on this nor repeat it; all the pieces of the system are connected in some way to all the others. When any effect is discussed, we have in mind the actual observed effect, which already includes the collective influences of all the interacting effects. Clearly, safety on different roadway types (Table 4-4) would be quite different in the absence of speed limits. Any safety differences attributed to different roadway types are for the actual speeds used. The engineering factors, and the relative importance indicated, is based on the detailed discussion in Chapter 4. Here we discuss only the human infrastructure component. The enormous influence of driver age (Chapter 3) and driver personality (Chapter 6) on crash rates can leave little doubt that the most important factor influencing traffic safety is individual human behavior. Hence this item is placed first in Fig. 13-5. It is subdivided into two broad categories; the one judged to be the less important of the two is discussed first. The threat of adverse outcomes certainly influences driver behavior, as discussed in Chapter 11. The near loss of control on a curve or a near rear-end crash may generate an immediate increase in driver caution. Drivers continuously react to their understanding of how conditions affect their vehicle's handling, thus exhibiting some properties characteristic of closed loop compensatory feedback control systems, as described formally by Cownie and Calderwood . While risk is omnipresent in driving, this does not mean that it forms the basis of the large numbers of decisions, or choices between alternatives, a driver is required to make. Almost every decision involves choosing between alternatives with different degrees of risk, even choosing between reading a book, watching television, or driving to a movie theatre. The choice to watch television is orders of magnitude more dangerous (risk of electrocution, picture tube implosion, radiation) than the choice to read a book, yet still orders of magnitude safer than driving to the movie theatre. Although the risks differ greatly, they exercise almost no influence on the relative popularity of books, television, and movies. In order to gain insight into the role of risk estimation in such choices as whether to drive slower or faster in normal driving, we examine a type of driving in which risk does play a more central role. light of the sample size of 14 for the entire time series (7 pre- and 7 post-World War II). The most recent fatality occurred in 1973, so, as, of 1990 there, have been 17 consecutive fatality-free runnings covering a total driving distance of somewhat under 0.3 million km; on US roads, the average driver-fatality rate is one per 120 million km. The number of crashes, and cars crashing, has remained remarkably stable since the race began. Fig 13-6 is compatible with the interpretation that crash rates have remained constant, but injuries and deaths per crash have declined (by about a factor of two), perhaps because of improvements in occupant protection and medical treatment. If one examines time rather than distance rates, then, because speeds have more than doubled, crashes per unit time of driving have increased by more than a factor of two, whereas injuries and fatalities are relatively trend free. The absence of large trends suggests that risk taking has increased approximately in step with physical changes in vehicle and roadway. Notwithstanding dramatic improvements in driver protection, vehicle reliability, braking, suspension, tire traction, roadway surface, etc., the adverse consequences per unit distance of travel have remained relatively unaffected in racing driving, quite unlike the large declines (Fig. 13-2) for normal driving. Racing drivers have used these "safety" improvements to increase winning average speeds from 120.0 km/h in 1911 to the recent record of 299.3 km/h set on 27 May 1990. Average speed is total travel distance (500 miles, or 804.7 km) divided by the race time, including pit stops; maximum average lap speeds are much higher, and maximum instantaneous speeds yet higher. That risk considerations should dominate racing driver behavior is plausible. Presumably, the human desire to excel and win is relatively invariant. As risk taking is increased, so is the chance of the glory of victory (not to mention the winner's million dollar purse). A conscious, or near conscious, balancing of the risks of, say, taking a corner a little faster than previously, versus the potential rewards, is likely to lead to similar rates of adverse outcomes today as in 1911. One can think of risk having an influence that varies from almost zero in deciding between watching television and going to a movie, to an almost total influence in deciding whether to drive faster in the Indianapolis 500. In order to evaluate its influence on normal driving, let us compare the racing driver fatality rate to the rate for normal driving. In 1988 in the US there were 27 260 drivers (of any vehicle) killed travelling 3260 billion km, giving 0.0084 driver fatalities per million km. The average rate (through 1986) for the Indianapolis 500 race is 12.0 driver fatalities per million km [Evans 1987]. In other words, on a per unit distance of travel basis, the racing rate is 1400 times that for average driving. If the racing rate applied to the US driver population, there would be over 30 million annual driver fatalities! the rates shown in Table 13-2. These rates may not indicate much of a problem to the individual driver, who has a subjective impression of driving safely, in an essentially risk-free environment, most of the time. Even when one of the adverse events occurs, it is rarely interpreted to be a natural consequence of many replications of aspects of normal driving behavior. Interpretations involving unpreventable bad luck are quite prevalent. Notwithstanding the individual driver's perception of no risk, a by-product of current US average driving is over 40 000 traffic fatalities per year. In a paradoxical sense, individuals may not perceive there is a problem, although at the national level there clearly is. Long term declines in fatality rates appear to reflect mainly a broad evolution in social norms relative to driving [Evans 1987; 1990]. Newly licensed drivers growing up in societies in which they and all their friends have been travelling in family-owned cars since birth, and who see much of car's use for such boring utilitarian functions as going to work or buying groceries, acquire different average views of driving than newly licensed drivers in societies in which to own a vehicle is to set one aside from the average citizen. An ongoing collective maturation process occurs as the vehicle evolves more in the direction of utilitarian use rather than use for "other motives" somewhat analogous to the process that occurs as an individual driver matures from age 18 to 40. As a society becomes more motorized, institutional changes are initiated in response to increasing casualties, which in turn influence driving social norms. Adherence to many traffic safety measures eventually evolves into habit, or autonomous behavior, without any conscious safety consideration. One obvious, and in many ways remarkable, example is that drivers tend to stop at red lights even in the absence of either traffic or police. Society abounds in examples of behavior of this type. Original motivations for improved personal hygiene were partially rooted in disease prevention. Such motivation rarely plays a role today. Rather, we find it difficult to conceive that prior highly civilized societies (like Elizabethan England) did not share our fastidiousness. Automatic safe driving may be a goal more worth pursuing than expecting drivers to always choose only prudent risks from the mix of available risks. That is, safety may best be advanced by drivers increasingly no more choosing between driving habits more likely to lead to crashes than those less likely to lead to crashes than they choose today whether to wash or not wash, or for that matter, to wear suits or togas. interventions are likely major contributors to such learning; there is no motorized jurisdiction that has simply ignored traffic safety. If one were to do so, my guess is that fatality rates would indeed decline, but at a much lower rate than observed for real jurisdictions. Koornstra  invokes community learning as contributing to the decline in traffic casualties per unit distance of travel, rather than Minter's  focus on the learning of individual drivers. Through community learning, changes aimed at increasing safety are introduced into the road network, vehicles, and the rules (as distinct from self motivation) governing individual behavior. He refers to this as "adaptation", and finds various similarities with adaptation theory as formulated by Helson . The notion of community learning seems to have much in common with the present interpretation in terms of social norms. Many (perhaps most) traffic crashes are caused by individuals whose norms differ from the mainstream (for example, in driving while intoxicated). However, these norms are subject to the same evolutionary processes as the overall norms. Indeed, it seems plausible to think that the extremes of behavior will move in directions similar to changes in the average. of the system (Chapter 6). Large casualty reductions are found to be associated with strict drunk-driving laws in the UK and in New South Wales, Australia (Figs 8-1 and 8-2). Legislative intervention is society's response to a problem that society recognizes, based largely on crash data. Individual drivers are unlikely to be able to identify major traffic risks from direct experience because of the sparsity of useful personal feedback (Table 13-2). If a driver is behaving in such a way as to double the chances of being killed, he or she has essentially no way of knowing this directly. When properly applied, legislative interventions can play an important role in increasing feedback to drivers behaving in ways likely to cause harm. Even though the probability that a speeding motorist receives a police citation is higher than for other adverse consequences of such behavior, it is nonetheless still low. Van Houten and Nau  describe a series of experiments in which different approaches to speed limit enforcement in Nova Scotia, Canada, are compared. They find that police handing out non-punitive location-specific informational warnings to speeding motorists led to larger, and more lasting, speed reductions than the normal speeding ticket approach. They explain that, because the warning approach involved less paper work and checking, and did not open the possibility that the police officer might have to appear in court, warnings could be handed out at a much greater rate (in one location, a factor of 6.7) than conventional speeding tickets. They also report positive public reaction to the warning approach, writing: "Several drivers, who were interviewed informally, stated that they did not mind having been stopped and felt that the police were doing a good job on behalf of the community as a whole". Geller  claims that positive incentives are more effective than punishments. Although a police warning could hardly be interpreted as a positive incentive, it at least moves in that direction especially when compared to the expected alternative. Van Houten and Nau  also report that the police preferred to hand out the warning messages rather than issue tickets because it entailed more positive interaction with the public. More frequent, but less unpleasant, interactions between police and drivers might also prove an effective drunk driver countermeasure because frequency of adverse consequence influences behavior more than severity. Legislative interventions should reflect society's accumulated technical knowledge. Legislative standards for, say, food purity, do not imply that ordinary citizens cannot, or should not, check if food has putrefied before consuming it. The standards augment informal learning, and offer a better approach than just letting the individual's fear of sickness and death be the sole monitors of food quality. Legislative interventions can be effective in providing drivers with more frequent feedback to unsafe driving actions than the natural consequences of such actions can provide. Measures which further increase the frequency of such feedback have potential. For example, police stopping vehicles for violations of existing anti-tailgating laws might help lead drivers to the broader safety goal of increasing spacing between their vehicles and other objects or road users likely to harm them, or be harmed by them. The stress should be on increasing the frequency of interaction, with the details of the punishment, if any, being a lesser consideration. The formalism in Fig. 13-5 aims at clarifying the relative importance of the few largest factors which have contributed to the dominant features of traffic safety, especially the long term declines in fatality rates with time. A formalism containing additional detail aimed more specifically at identifying interventions is shown in Table 13-3. All interventions are characterized as occurring before (that is, crash avoidance) or during the crash. The third phase of the matrix introduced by Haddon , namely, post crash, is not included. This phase relates mainly to medicine and emergency medical service, which is better considered separately from the factors more specifically related to traffic. High technology refers mainly to new applications of electronics, such as anti-lock braking, radar obstacle detection, enhanced night vision, driver fatigue detection, computer control of traffic, navigational aids and the like. Traditional technology includes mechanical engineering, electrical engineering and civil engineering. Mechanical and electrical engineering contribute to crash avoidance by enhancing the performance and reliability of such safety related systems as brakes, tires, lights, etc. Civil engineering, in the form of roadway construction, and to a lesser extent, the overall traffic control system, makes even larger contributions. By behavior modification we mean changes in behavior with consequent changes in safety, independent of what motivated the changes. For example, economic downturns are associated, through behavior change, with reduced crashes [Joksch 1984; Partyka 1984], but are not initiated for that purpose. By specific changes we refer to more focused measures aimed specifically at increasing safety, such as campaigns to increase belt wearing rates or to change laws. Attributes of harm reduction approaches in Table 13-3. The possibility that a small number of decision-makers (manufacturers, legislators, regulators) could cause passive occupant protection devices to be installed on all vehicles figures as a central element in the thinking of many of those who have advocated them [Haddon 1974; Haddon 1980a;b; Ross 1988]. In contrast, universal safety belt use in the US requires over a hundred million occupants to belt up each time they get into a vehicle. Technological decisions usually involve a relatively small number of decision makers, although issues like freeway-building often involve a wider public. While focused attempts to modify driver behavior might involve a small number of decision makers, broad changes in social norms involve a large fraction of the population. because of stopping smoking or modifying diet. No family can know that, were it not for changes in the availability of alcohol, their now healthy teenager would be dead or seriously injured. An intervention which saves one or two identifiable lives may attract far more public support than one which saves thousands of anonymous lives. Conceptually, the easiest countermeasures to evaluate quantitatively are passive crash-phase devices. Such evaluations depend only on the biomechanical effectiveness of the device, assuming that its introduction does not induce behavior changes, such as driving faster or not wearing safety belts. Evaluating active devices involves all the practical difficulties of evaluating passive ones, plus the additional problems of estimating not only use rates, but the extent to which users and non-users differ in other ways (Chapter 10). Effectiveness of crash-phase occupant devices, whether passive or active, is expressed as the percent reduction in some level of injury, such as fatality (Table 9-6). These benefits are necessarily less than the benefits of reducing crash involvement rates by the same percentages, because when the crash is avoided all injury is prevented, whereas crash-phase devices convert injuries to lower (but in many cases still severe) levels of injury. Quantifying the effects of crash-avoidance vehicle-borne technology has, with few exceptions, proved difficult. One exception is the high mounted stop light, which studies show has reduced the probability of being struck in the rear while braking by 17% (Chapter 4). Because of human behavior feedback (Chapter 11) and other intrinsic difficulties, it is difficult to estimate the system-wide effects of such measures as improved brakes. More difficult still is the task of linking changes in safety to broad changes in social norms regarding driving. The intrinsic difficulty here is that even if large permanent changes do occur, they occur gradually over extended periods. There is no possibility of a simple "before" and "after"
comparison. The problem of evaluating any process occurring continuously over many decades against a background of innumerable other changes seems intractable. As we are forced to use judgment, I feel that the purposes of this chapter are best served by stating my own judgmental ranking, based in part on the discussion above and below, of the contributions of the six harm-reducing approaches in Table 13-3. Even though the long term slow evolution of behavior change regarding driving is the factor about which we have least specific quantitative information, it is the one I rank as having contributed most, followed by road building, although such legislative interventions as speed limits undoubtedly also contributed. High technology interventions are current or future, so have not influenced prior safety. Passive protection is ranked above active because the various safety improvements incorporated in vehicles are estimated (Chapter 4) to have provided accumulative benefits far in excess of the estimated 7% occupant fatality reduction (Chapter 10) associated with present safety belt use in the US. Even the benefits of proceeding from present to higher wearing rates are still unlikely to exceed those associated with the accumulated effectiveness of all prior passive improvements. because many of the technologies are reaching saturation, or levels of diminishing returns. This same point is emphasized by Koshi , who attributed most of the decline in Japan's fatalities from 1970 to 1983 to road-building, but now that that process is reasonably complete, he looks to behavior changes for further fatality declines. The future potential of passive protection to reduce harm is ranked lower than that of active because the half-dozen or so most effective passive improvements are already in place (Table 4-3), while universal belt use has not been achieved anywhere. Unless the technical community has overlooked something obvious, it is hard to conceive of other passive improvements that could contribute much more than the lowest values in Table 4-3. Apart from contributions form airbags, which reduce fatality risk to belted drivers by 8.6% and to unbelted drivers by 18% (Chapter 9), and car mass which can have larger effects (Chapter 4), other passive improvements confront ever diminishing returns. On the other hand, there are still large gains to be achieved from increased safety belt wearing rates; additional smaller gains can occur from increasing use rates in rear seats, especially when augmented by the increasing availability of lap/shoulder belts in outboard-rear seats. Fatality reductions from universal belt use, compared to present US levels of use, exceed those achievable from airbags. related to driving. In Chapter 7 we find that if alcohol had played the same role in 1987 it did in 1982, the 1987 fatality total would have been 6000 greater. These changes probably are due in part to the cumulative interactive effects of many factors, including activities of citizen activist groups such as MADD, and many legislative changes relating to the availability of alcohol to young drivers who contribute so large a fraction of fatalities (Chapter 8). Arguably, the most important aspect of all was the widespread serious discussion of the tragic dimensions of the problem in the media, with the consequent deglamorizing of the drunk as a likeable humorous character. The large fatality reduction was probably due not to any one of these ingredients, or even to the sum of their effects, but to the synergistic results of the interactions between them. A perhaps even more striking change in social norms regarding a safety issue is the change that has occurred in the last 25 years in the US regarding smoking, as discussed in Chapter 8. Dramatic changes in prevailing US social norms regarding smoking are readily apparent. The smoking hero has so totally disappeared from the modern entertainment scene that in older movies he looks more comical than heroic to many younger Americans. Who in 1965 could have predicted that after 26 January 1990 smoking would be prohibited on all commercial airline flights throughout the North American continent? norm relative to driving that differs from the overall norm. A change in the norms of this group towards increasingly responsible use of the automobile would probably generate larger safety benefits than changes in any other group. Each year, TV viewers see several thousand irregular driving acts and hundreds of instances where people are endangered, typically performed in an engaging manner by attractive characters who suffer minimal harm. Based on the content analytic findings and television effects theories, the following influences may be expected for the viewing audience. First, viewers can acquire and possibly imitate an array of unique and novel driving acts that are depicted on television but seldom observed first-hand. Second, inhibitory constraints may be reduced as viewers learn that irregular or dangerous driving practices are commonplace and normative (and perhaps justified in various circumstances); external inhibitions may be minimized by the relatively infrequent portrayal of serious negative consequences such as legal punishment, social disapproval, and physical harm resulting from illegal or high-risk behavior. 1990], and in the following example. In the mid 1970's in Japan there was a number of particularly tragic crashes involving riders of two-wheeled vehicles being struck by left-turning traffic (equivalent to right-turning in America and Europe). In one incident, a left-turning truck struck a mother transporting her two children to kindergarten by bicycle, killing all three. These incidents generated widespread media coverage and discussion of left-turn crashes, leading to changes in truck design, and probably more importantly, changes in awareness on the part of all road users of the possibility of such crashes. The fraction of all fatalities due to left-turn crashes declined by a factor of two from 1977 to 1988 [Nagayama 1990]. Another facet of driving closely related to that of social norms is that of courtesy on the road. In early stages of motorization driving is an adventurous and macho activity, often characterized by competitiveness and a "king of the road" attitude. As motorization matures, and driving becomes more universal, it seems to me that drivers might become more receptive to the notion that the other drivers they take such pleasure in intimidating might be on the way to pick up their grandchildren. Drivers should become more aware of the problems that older, and handicapped, drivers face, and take pride in the same courteous behavior they would exhibit to the elderly or handicapped when, say, getting into an elevator. If the type of courtesy that applies in most walks of life were applied more on the road, it seems likely that substantial safety benefits would result. associate the product with the types of positive attributes to which a healthy young male aspires. In contrast, hard liquor, which is favored more by older consumers, who are substantially safer drivers, is not advertised on television. Education can make a contribution mainly by influencing attitudes and by imparting knowledge that will not be acquired by direct experience (Chapter 6). Most of the task of driving is learned by direct feedback from the task itself; safety must be imparted by less direct means because direct feedback is far too sparse. To expect drivers to learn safety by driving is somewhat like expecting people to learn the value of smoke-detectors by having their houses burn down. Despite the enormous reinforcement that houses do not generally burn down, that child pedestrians do not normally dart into the road, and that bicyclists do not normally fall off their bicycles, safety requires that people behave as if such events may in fact occur. More progress seems to have been made in sensitizing people to the possibility of the house fire than the unexpected event in traffic, perhaps because of the greater feeling of control in traffic, and the absence of a marketable product in the traffic-crash case. behavior, such as the one aimed at increasing belt use [Robertson et al. 1974], is to be expected. Broad changes of the type required to increase safety arise from the synergistic interaction of many factors. A specific set of advertisements aimed at reducing smoking is unlikely to generate any observable effect, yet, as discussed in Chapter 8, behavior changes stimulated in large measure by information the public received through the mass media, accumulated over a 25-year period, have been large. are acquired by a social process not all that different from that generating hygienic habits. 3. Alcohol taxation and advertising policy, especially its influence on beer consumption by young male drivers. Adams, J.G.U. Smeed's law, seat belts and the emperor's new clothes. In: Evans, L.; Schwing, R.C., editors. Human behavior and traffic safety. New York, NY: Plenum Press, p. 193-248; 1985. Atkin, C.K. Television, socialization and risky driving by teenagers. Alcohol, Drugs and Driving 5(1):1-11; 1989. Broughton, J. Predictive models of road accident fatalities. Traffic Engineering and Control 29(5):296-300; 1988. Cownie, A.R. ; Calderwood, J.H. Feedback in accident control. Operational Research Quarterly 17:253-262; 1966. Evans, L. Factors controlling traffic crashes. Journal of Applied Behavioral Science 23:201-218; 1987. 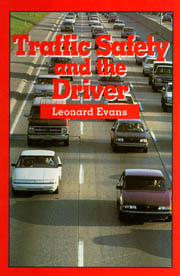 Evans, L. An attempt to categorize the main determinants of traffic safety. Health Education Quarterly 5(2):(in press) 1990. Federal Highway Administration. Fatal and injury accident rates on public roads in the United States. Publication FHWA-SA-90-029, Washington, DC; 1990 (in press). Flora, J.A. ; Maibach, E.W. ; Maccoby, N. The role of media across four levels of health promotion intervention. Annual Reviews of Public Health 10:181-201; 1989. Geller, E.S. A delayed reward strategy for large-scale motivation of safety belt use: a test of long term impact. Accident Analysis and Prevention 16:457-464; 1984. Greenberg, B.; Atkin, C. The portrayal of driving on television, 1975-1980. Journal of Communication 33:44-45; 1983. Haddon, W., Jr. A logical framework for categorizing highway safety phenomena and activity. Journal of Trauma 12:193-207; 1972. Haddon, W., Jr. Strategy in preventive medicine: passive vs. active approaches to reducing human wastage. Journal of Trauma 14:353-354; 1974. Haddon, W., Jr. Advances in the epidemiology of injuries as a basis for public policy. Public Health Reports 95:411-421; 1980a. Haddon, W., Jr. Options for the prevention of motor vehicle crash injury. Israel Journal of Medical Sciences 16:45-64; 1980b. Hauer, E. Fatal and injury accidents: some interesting trends. The Safety Network 4(3), Canadian Association of Road Safety Professionals, Toronto, Canada; December 1988. Helson, H. Adaptation-level theory. New York, NY: Harper and Row; 1964. Holding, C. Health care in the Soviet Union. Science 213:1090-1092; 1981. Jacobs, G.D. The potential for road accident reduction in developing countries. Transport Reviews 2:213-224; 1982. Joksch, H.C. The relation between motor vehicle accident deaths and economic activity. Accident Analysis and Prevention 16:207-210; 1984. Koornstra, M.J. Development of road safety in some European countries and the USA -- a theoretical and quantitative mathematical analysis. Paper presented to Road Safety in Europe, Gothenburg, Sweden; 12-14 October 1988. Koornstra, M.J. A general system approach to collective and individual risk in road safety. Paper presented to the International Symposium on Driving Behaviour in a Social Context, Paris, France; 16-18 May 1989. Koshi, M. Road safety measures in Japan. In: Evans, L.; Schwing, R.C., editors. Human behavior and traffic safety. New York, NY: Plenum Press, p. 27-36; 1985. Michon, J.A. Explanatory pitfalls and rule-based driver models. Accident Analysis and Prevention 21:341-353; 1989. Minter, A.L. Road casualties -- improvement by learning processes. Traffic Engineering and Control 28:74-79; 1987. Motor Vehicle Manufacturers Association. MVMA motor vehicle facts and figures. Detroit, MI (issued annually). National Highway Traffic Safety Administration. Fatal Accident Reporting System 1988. Document DOT HS 807 507. Washington, DC; December 1989. National Safety Council. Accident facts. Chicago, IL. 1989 edition (issued annually). Oppe, S. Macroscopic models for traffic and traffic safety. Accident Analysis and Prevention 21:225-232; 1989. Partyka, S.C. Simple models of fatality trends using employment and population data. Accident Analysis and Prevention 16:211-222; 1984. Postman, N.; Nystrom, C.; Strate, L.; Weingartner, C. Myths, men and beer: an analysis of beer commercials on broadcast television. Washington, DC: AAA Foundation for Traffic Safety; 1987. Robertson, L.S. ; Kelly, A.B. ; O'Neill, B.; Wixom, C.W. ; Eiswirth, R.S. ; Haddon, W., Jr. A controlled study of the effect of television messages on safety belt use. American Journal of Public Health 64:1071-1080; 1974. Ross H.L. Deterrence-based policies in Britain, Canada, and Australia. In: Laurence M.D. ; Snortum J.R.; Zimring F.E., editors. Social control of the drinking driver. Chicago, IL: University of Chicago Press, p. 64-78; 1988. Sagan, L.A.; Afifi, A.A. Health and economic development II: longevity. Research memorandum RM-78-42. Laxenborg, Austria: International Institute for Applied Systems Analysis; August 1978. Sivak, M. A 1975 forecast of the 1985 traffic safety situation: what did we learn from an inaccurate forecast? In: Rothergatter, J.A. ; de Bruin, R.A., editors. Road users and traffic safety. Assen/Maastricht, Netherlands: Van Gorcum, p. 13-25; 1987. Sleet, D.A. Reducing motor vehicle trauma through health promotion programming. Health Education Quarterly 11:113-125; 1984. Sleet, D.A. ; Hollenbach, K.; Hovell, M. Applying behavioral principles to motor vehicle occupant protection. Education and Treatment of Children 9:320-333; 1986. Smeed, R. Some statistical aspects of road safety research. Journal of the Royal Statistical Society, Series A 112:1-34; 1949. Smeed, R. Variations in the pattern of accident rates in different countries and their causes. Traffic Engineering and Control 10:364-371; 1968. Thomas, R.; Gallon, C.A. Motorway accidents: associations between characteristics -- related variables. Traffic Engineering and Control 29(9):456-465. Trinca, G.W. ; Johnston, I.R. ; Campbell, B.J. ; Haight, F.A. ; Knight, P.R. ; Mackay, G.M. ; McLean, A.J. ; Petrucelli, E. Reducing traffic injury -- a global challenge. Melbourne, Australia: A.H. Massina; 1988. Van Houten, R.; Nau, P.A. Feedback interventions and driving speed: a parametric and comparative analysis. Journal of Applied Behavior Analysis 16:253-281; 1983. Wildavsky, A. Searching for safety. New Brunswick, NJ: Transaction Books; 1988. Zeckhauser, R.J.; Viscusi, W.K. Risk within reason. Science 24:559-564; 1990. Table 13-1. Fit of the data for the 12 countries in Fig. 13-1 to logeR = a + bt, or R = A exp (bt), where R is the fatality rate in deaths per billion km, t is time in years since 1900, and A = exp(a). Table 13-2. The approximate average frequencies with which various adverse consequences occur, expressed relative to an individual driver. (a) Fatal Accident Reporting System . (b) Estimated from National Safety Council [1988 p. 55] by assuming that all injuries not to pedestrians or pedalcyclists are to vehicle occupants, and that average vehicle occupancy is 1.2. (c) 21 year value from the State of California - values in other states generally lower as indicated by range. The distance rates are calculated taking 3260 billion km per year as the total travel by all the vehicles in the US [Federal Highway Administration 1990]. The time rates (when calculated) are obtained by assuming that the average vehicle travels 16 800 km per year [Motor Vehicle Manufacturers Association 1988, p. 52]. Table 13-3. Attributes of different approaches to protecting road users.